During development of the Meteor, skeptical elements of the Air Ministry had expected mature piston-powered aircraft types to exceed the capabilities of the Meteor in all respects except that of speed; thus, the performance of early Meteors was considered favourable for the interceptor mission, being capable of out-diving the majority of enemy aircraft. 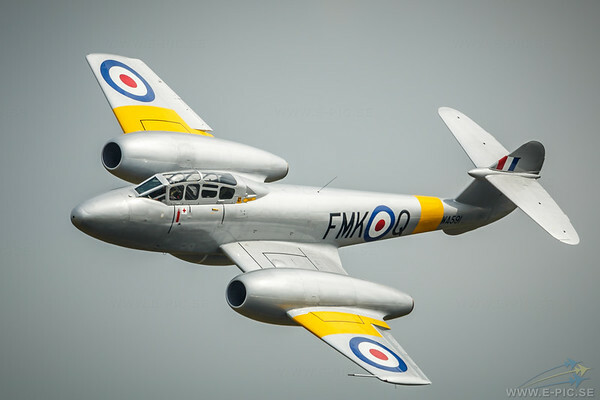 The conclusion of in-service trials conducted between the Meteor F.3. and the Hawker Tempest V was that the performance of the Meteor exceeded the Tempest in almost all respects and that, barring some manoeuvrability issues, the Meteor could be considered a capable all-round fighter. Pilots formerly flying piston-engine aircraft often described the Meteor as being exciting to fly. Ex-RAF pilot Norman Tebbit stated of his experience of the Meteor: "Get airborne, up with the wheels, hold it low until you were about 380 knots, pull it up and she would go up, well we thought then, like a rocket".